A nuclear-powered U.S. supercarrier led an armada of warships in exercises off the Korean peninsula on Sunday that North Korea has vowed to physically block and says could escalate into nuclear war. U.S. military officials said the maneuvers, conducted with South Korean ships and Japanese observers, were intended to send a strong signal to the North that aggression in the region will not be tolerated. Tensions on the Korean peninsula have been particularly high since the sinking in March of a South Korean naval vessel. Forty-six Korean sailors were killed in the sinking, which Seoul has called Pyongyang's worst military attack on it since the 1950-53 Korean War. The military drills, code-named "Invincible Spirit," are to run through Wednesday with about 8,000 U.S. and South Korean troops, 20 ships and submarines and 200 aircraft. 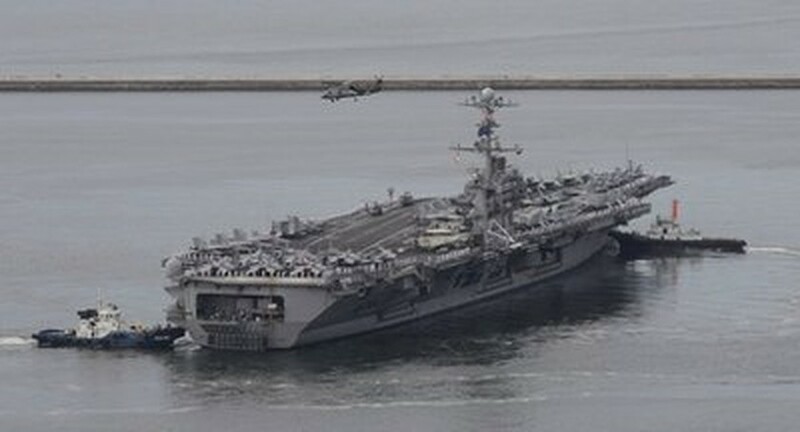 The Nimitz-class USS George Washington was deployed from Japan. "We are showing our resolve," said Capt. David Lausman, the carrier's commanding officer. North Korea has protested the drills, threatening to retaliate with "nuclear deterrence" and "sacred war." The North routinely threatens attacks whenever South Korea and the U.S. hold joint military drills, which Pyongyang sees as a rehearsal for an invasion. The U.S. keeps 28,500 troops in South Korea and another 50,000 in Japan, but says it has no intention of invading the North. Still, the North's latest rhetoric carries extra weight following the sinking of the Cheonan. Capt. Ross Myers, the commander of the carrier's air wing, said the exercises were not intended to raise tensions, but acknowledged they are meant to get North Korea's attention. The George Washington, one of the biggest ships in the U.S. Navy, is a potent symbol of American military power, with about 5,000 sailors and aviators and the capacity to carry up to 70 planes. "North Korea may contend that it is a provocation, but I would say the opposite," he said. "It is a provocation to those who don't want peace and stability. North Korea doesn't want this. They know that one of South Korea's strengths is its alliance with the United States." He said that North Korea's threats to retaliate were being taken seriously. "There is a lot they can do," he said. "They have ships, they have subs, they have airplanes. They are a credible threat." The exercises are the first in a series of U.S.-South Korean maneuvers to be conducted in the East Sea off South Korea's east coast and in the Yellow Sea closer to China's shores in international waters. The exercises also are the first to employ the F-22 stealth fighter — which can evade North Korean air defenses — in South Korea. South Korea was closely monitoring North Korea's military but spotted no unusual activity Sunday, the Defense Ministry said. North Korea, which denies any involvement in the sinking of the Cheonan, warned the United States against holding the drills. "Our military and people will squarely respond to the nuclear war preparation by the American imperialists and the South Korean puppet regime with our powerful nuclear deterrent," the North's government-run Minju Joson newspaper said in a commentary Sunday headlined, "We also have nuclear weapons." The commentary was carried by the official Korean Central News Agency. The North's powerful National Defense Commission issued a similar threat Saturday, saying the country "will start a retaliatory sacred war ... based on nuclear deterrent any time necessary in order to counter the U.S."
The country's Foreign Ministry separately said Saturday that Pyongyang is considering "powerful physical measures" in response to the U.S. military drills and sanctions. Though the impoverished North has a large conventional military and the capability to build nuclear weapons, it is not believed to have the technology needed to use nuclear devices as warheads. North Korea has been in increasingly difficult diplomatic straits since the Cheonan incident. U.S. Secretary of State Hillary Rodham Clinton announced Wednesday, after visiting the Demilitarized Zone dividing the two Koreas, that the U.S. would slap new sanctions on the North to stifle its nuclear ambitions and punish it for the Cheonan sinking. On Friday, the European Union said it, too, would consider new sanctions on North Korea. The George Washington had been expected to join in exercises off Korea sooner, but the Navy delayed those plans as the United Nations Security Council met to deliberate what action it should take over the Cheonan sinking. The council eventually condemned the incident, but stopped short of naming North Korea as the perpetrator.